Happy First Friday of 2012, Noshers! Any fun plans this weekend? 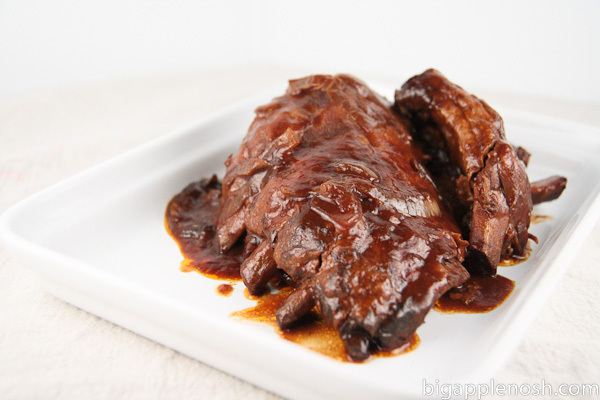 Just one of the many things you can make in a slow cooker – ribs! January is National Slow Cooking Month. Tune in next week, when I share one of my favorite slow cooker recipes! Have a great weekend! Do you have a slow cooker? What’s your favorite slow cooker recipe? Oh. heck. yes. We just got a slow cooker and I’m in love with it. Can’t wait for this post!! Happy Friday! I don’t have any slow cooker recipes, but yum! I love slow cooker recipes and definitely have a few new ones I’m excited to try this winter. Those ribs look delicious! i just got myself a small slow cooker last month…a mini 2 quart one! ive only made soup (3x), pulled pork and pulled chicken so far. can’t wait to try some more recipes! I’m devoting some time this weekend (post farmer’s market) to slow cooker freezer prep for some dinners! yippee! We’ve had a slow cooker for awhile, but just got a timer for it so that it can click off during the day when we’re not home! We like to make Indian food, like dahl and cholay. Yum! We just got a slow cooker and our first try at chicken korma was a huge fail, can’t wait to see your recipe! I LOVE cooking with my slow cooker!! Nothing better than coming home to a heavenly scent of dinner being ready after a long day at work. I wish I had a slow cooker! I wonder if people have those in China. 🙂 I’ve never used one before. You should post recipes every week in Jan! I haven’t had much success with my slow cooker, but maybe your recipe will break the streak. i’ve mostly made so-so chili, and blah chicken stew. i don’t know any slow cooker recipes, but those ribs looks so good! can’t wait to read your post.